Jeffrey Petersen and his team in hot pursuit of Oakcliff staff Chris Kennedy who finished third. Last weekend, I competed in the United States Match Racing Championship at Oakcliff Sailing Center in Oyster Bay, New York. I raced against the best in the nation for the title of United States Match Racing Champion. 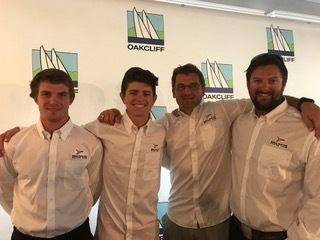 Some of the other skippers at this event were David Storrs, Peter Holz, and last year’s winner, Nevin Snow from San Diego, who is currently ranked 15th in the World. This event was raced by representatives from each of the major US Sailing areas, who qualified in events held around the country. WOW that was some tough racing! This event was so competitive and fun to race in. The boats and the venue were top notch. 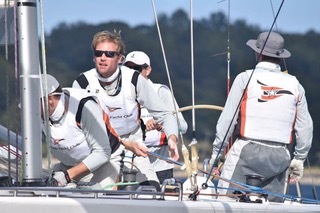 The regatta consisted of a single round robin, a quarter-final, a semi-final, and a final round. Unfortunately, due to our round robin score, we did not make the quarter finals. We raced in a first-to-two consolation round for 9th and 10th on Saturday. But, that didn’t mean the racing was any less intense; those three races were among the closest I’ve ever had. Each start was a dog fight and every leg was a battle with no mercy. After the first two races Reed Baldridge (College of Charleston) and I were 1-1. That put us in a must win situation to stay out of last place. Max Moosmann killin’ it on trim before he injured his back and had to stop racing. The 7-minute gun went off and we were in sequence. Little did I know this was going to be the closet and most interesting race of my sailing career thus far. We had a crush start spilling dirty air on top of Reed. He tacked off and we let him go for the split. As we headed out to the left, he chugged out right. Now, keep in mind all this racing was done in about 1.5 knots of breeze. All the other concurrent matches had finished or abandoned due to the extremely light breeze. All other competitors had dropped their jibs and were just drifting around. For a time, this was the most exciting thing happening out on the racecourse! We finally tack back and end up bow to bow with Reed: the start of an exhausting back and forth. He sneaked ahead to round the weather mark first but we passed him on the downwind, only to have him pass us again before the bottom mark! We rounded behind him at the gate and our boat parked completely. We had no boat speed whatsoever. He got into some new pressure that we didn’t and he was launched. I thought the race was over and that we were going to take 10th place. But, as our pit guy predicted going up wind after we rounded the top mark for the last time, we turned on the afterburners and caught him on the downwind leg. This was classic Newport Beach conditions and we knew we could beat him if we just kept at it. We caught up enough as the breeze filled behind us to get overlap with him, lead change number 4. After that we had an epic light air battle, with each of us passing and then falling behind again. At this point, we were stuck under him and were totally screwed if any new pressure were to come, so we decided to head him up. 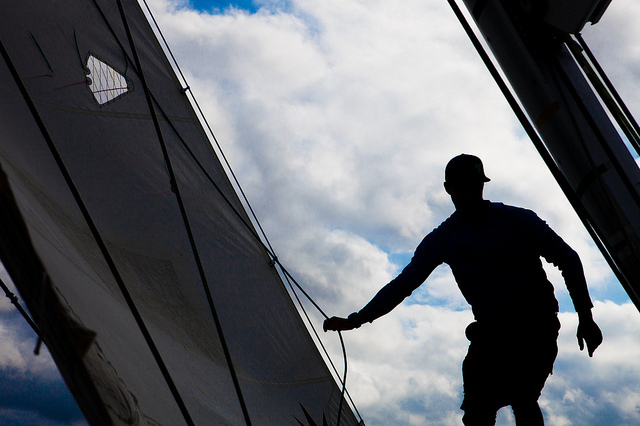 We got his spinnaker all wrapped up and the gybed away, lead change number 5. He got his kite full and it was an all out drag race to the finish. Our tactician, Christophe Killian (2017 Governor’s Cup Champion), wasn’t going to let it end that way. He called for a gybe and we came back at Reed on Starboard with rights forcing him to gybe yet again and avoid. Immediately after his gybe we luffed him and gybed away, just like last time. We crossed the line ahead of him, taking the final win in our bracket to win the consolation round after 6 lead changes and a huge comeback. Now, this was not where we hoped to finish but, we were still happy because these skippers and crews are some of the best in the world. We knew it was going to be some tough sailing. All these sailors have been sailing for a lot longer than I have, some of which have been sailing for much longer than I have even been alive. David Storrs, who won the event, is 73 years old and spent all summer at Oakcliff training for this event. He also hired a great crew from the New Zealand America’s Cup team to support him. I was the youngest skipper at the age of 15 and the youngest to ever compete in this event. All the competitors we great and treated me like one of their own. David Storrs even told me about the time he paid the damage deposit for a very upset teenage sailor who had experienced a bad collision and was terrified that his parents would make him work off the debt. Thankfully, I was never in that position at this event. I did not make a big deal about it, but this was only the third match race regatta ever that I have skippered. I have done a ton of dinghy fleet racing and currently race on the varsity sailing team for Mater Dei High School. My big boat experience started when I was about 7 and was invited to race keelboats with my Dad and various boat owners from Balboa Yacht Club, including Andy Rose, Peter Bretschger and Jim Devling. These boat owners, as well as others from other clubs, have given me the opportunity to crew at all positions on the boat and learn as much as I can. I also never passed up an opportunity to work mark-set or Race Committee for BYC events. I went into this event with a mind set of just go have fun and learn as much as I could. We raced a full round robin and I learned so much in those 10 races. Even though we did not win them, we held leads and were in the hunt in most of those matches. I even drew a few penalties on the leaders of the event, which I think surprised them. I could hardly wait to keep racing, so that I could take what I learned and use it to my advantage. Overall we finished the regatta in 9th. We had such a great time, and can’t wait to get back out there and race those competitors again! We especially want to thank US Sailing and event organizer, Bill Simon for giving us the opportunity to sail in this event. 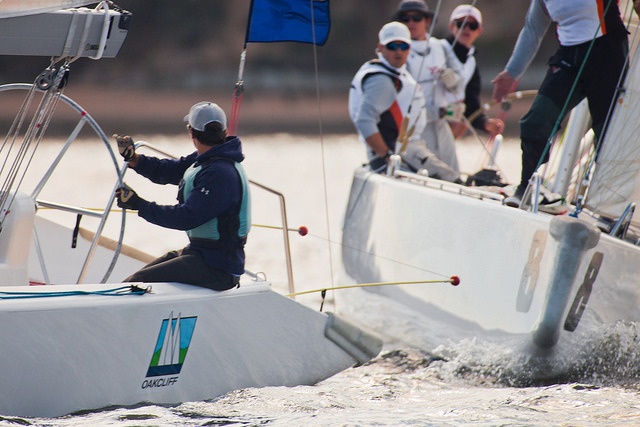 We also want to thank Oakcliff Sailing Center for their hospitality and for hosting this outstanding event. Their program and facilities are amazing and I can’t wait to go back and maybe spend a summer sailing there. I want to thank my crew: Chris Bretchger, Tyler Wolk, Max Moosmann and Christophe Killian, all BYC members, ranked match racers, regular Fast 50 and TP-52 class sailors, but most of all my friends and big brothers. I would like to also thank the local sailing foundations who provided funding to my team. The total budget for this event for us was just over $5,000. Without financial support, Cricket Racing would not have been able to attend this event. Those foundations are: Balboa Yac ht Club’s Maritime Sciences and Seamanship Foundation, Newport Harbor Yacht Club’s Newport Harbor Sailing Foundation, Bahia Corinthian Yacht Club’s Bahia Sail Race Foundation and my own club, Balboa Yacht Club’s Race Council. I am the luckiest teenager alive and these groups help make it possible for me to travel around the world and do what I love. Next up, I have accepted an offer to do bow for my best friend, Porter Killian in the Harken and Musto Youth Match Race events in Sydney, Australia in late November. His team is named Saber Racing. Follow us on Facebook through the Cricket Racing page for updates on results, conditions, and race recaps.